It’s April 12th, 1861: Abraham Lincoln has just won the 1860 Presidential election and Southern fears that slavery will be abolished have reached a peak. Extremist Southern Democrats known as “Fire Eaters” have triumphed the Ordinance of Secession. Confederate forces fire upon Fort Sumter, demanding that Union troops vacate the island. Over 4,000 mortar shells destroy the fort upon their refusal. “The roaring and crackling of the flames, the dense masses of whirling smoke, the bursting of the enemy’s shells were exploding in the burning rooms. The sound of masonry falling in every direction made the Fort a pandemonium,” reports Abner Doubleday, Union General. Meanwhile, genteel Charlestonians pack the city rooftops to observe the pyrotechnics. Danger aside, they row cheering into a boat-packed harbor, not knowing that their jubilation will turn to despair as the war wages on. Union soldiers surrender Fort Sumter the following day. Though this first battle was largely bloodless, it began the deadliest conflict in American history. The National Park Rangers at Fort Sumter are friendly and knowledgeable, available to answer all of your questions about the historic Fort Sumter National Park. 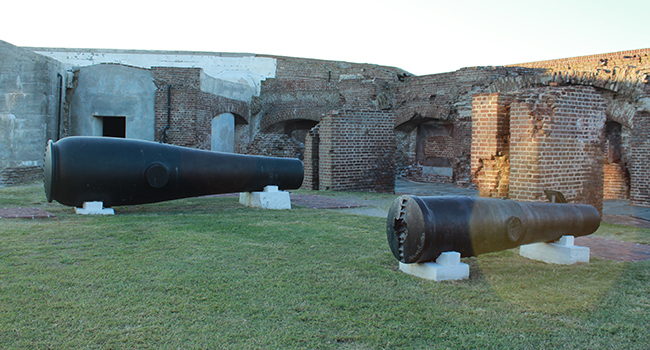 Fort Sumter evokes different emotions in each tour guest, American citizen or foreign visitor. The National Park represents the beginning of the deadliest and most divisive conflict in American history, a civil war that pitted countryman against countryman and brother against brother. Yet somehow, from its ashes arose a country stronger and more united today. A visit to the Fort Sumter National Historic Park will also provide unlimited photo opportunities for you, your group, or your family. Many tour guests agree that historic Charleston is most beautiful from the water, when dolphin sightings are common and sunsets visible in all their splendor. Images captured while touring such a historic site make for important and valuable keepsakes.